If daily fantasy existed fifteen years ago, Hall of Fame running back Marshall Faulk would have broken the salary cap. Faulk posted a silly 2,189 total yards and 26 touchdowns in 14 games that year, en route to the best fantasy point per game average in NFL history. He finished third in the NFL in touches, fifth in carries inside the 5-yard line, and his 10-6 Rams led more than they trailed. Faulk’s volume, touchdown potential, and game script all played a key role in his record-setting season, just as they do for a running back’s value in daily fantasy. Total touches have a stronger correlation1 to running back fantasy points than any efficiency metric. In fact, all the opportunity measures – carries, receptions, snaps and red zone touches – are more strongly correlated to fantasy points than efficiency metrics – yards per touch, yards per carry and yards per reception. Prioritize volume over efficiency when selecting a daily fantasy running back. Table 1 below shows how various statistical categories correlate to fantasy points per game using FanDuel and DraftKings scoring systems. The sample includes qualified2 running backs from 2013 and 2014. Total yardage accounts for over 75 percent of running back fantasy points on average, and the best way for a running back to rack up volume is to get a steady diet of touches. Touches, rushing attempts, receptions, and percentage of workload stats can be tracked in 4for4’s Player Workload Report. The strong correlation of snaps to fantasy points in Table 1 further underscores the importance of prioritizing a running back’s volume and role. The more a running back remains on the field, the more touches he will get, and the more likely he is to produce fantasy points. Snap counts can be found in 4for4’s Weekly Snap App. A running back’s upside should be viewed as touchdown potential rather than as big-play potential. Touchdowns are more common than big plays – the league averages 0.77 rushing touchdowns per game compared to 0.64 twenty-plus yard rushes. Furthermore, only 16 percent of those 20-plus yard rushes even go for touchdowns. Seventy-six percent of the time, a running back needed at least one (rushing or receiving) touchdown to reach 15 FanDuel points. I determined that by taking all running back games with at least 10 FanDuel points during the last two seasons and sorting them into buckets, then calculating what percentage of the time those games included scored zero, one, or multiple touchdowns. The results are in Figure 1 below. 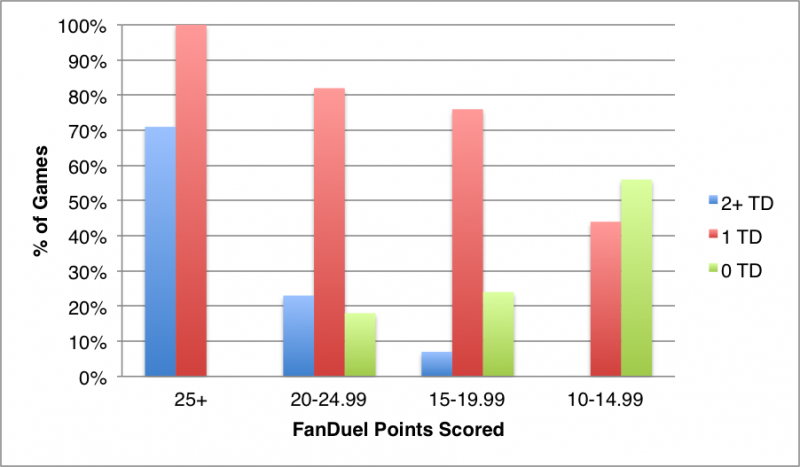 Figure 1: How Many TDs Does a RB Need to Hit FanDuel Scoring Benchmarks? In contrast to FanDuel, DraftKings’s full-point-per-reception format renders touchdowns less important than they would be on a half-point-per-reception format, yet 60 percent of running backs who scored 15 or more DraftKings points in a game needed at least one touchdown to do so. 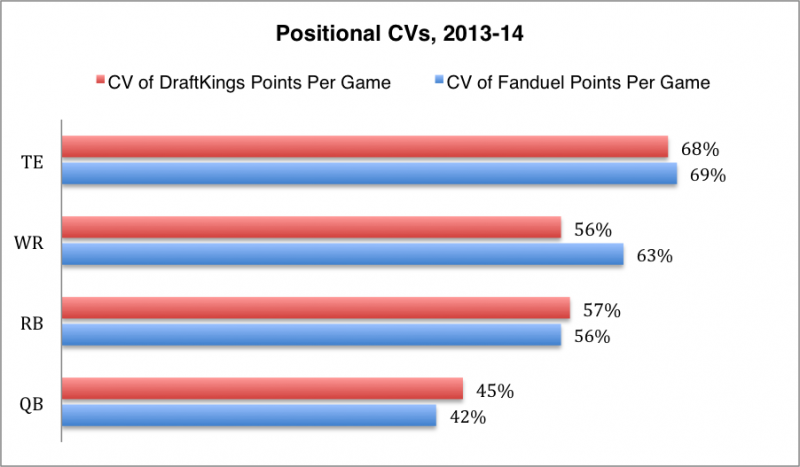 Figure 2 below shows the results of the above study repeated for running back games with at least 15 DraftKings points. 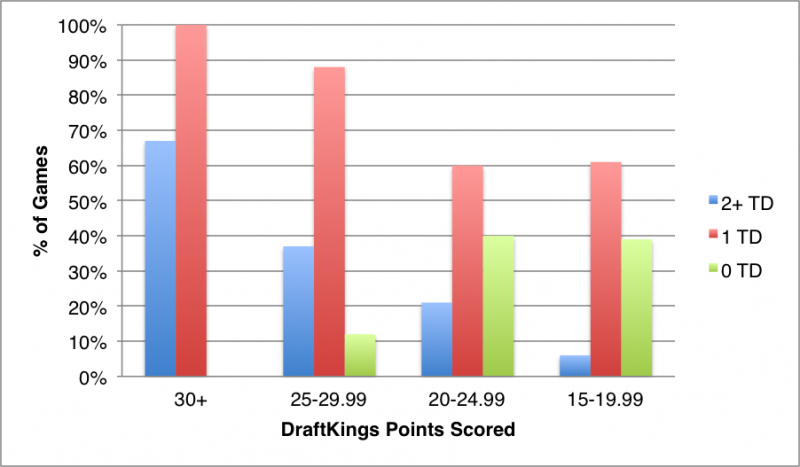 Figure 2: How Many TDs Does a RB Need to Hit DraftKings Scoring Benchmarks? Recent big play production will often cause a running back to be overvalued, and thus, over-owned on daily fantasy sites. Since big plays aren’t sustainable, a back’s recent stats would undergo an artificial inflation due to the big plays he broke off, leading his salary to be artificially inflated as well. Memorable but unsustainable, big plays can be a tremendous boost to a runner’s fantasy output, but occur too infrequently to be counted on as a reliable source of fantasy production. For example, LeSean McCoy is commonly thought of as a big-play back with high upside due to his speed and agility. 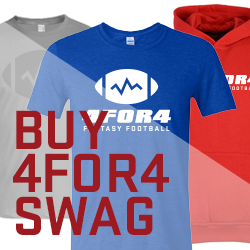 Despite those skills, Shady was a poor tournament play last season – he failed to reach 20 FanDuel points even once. In 2013, he ripped off what turned out to be an unsustainable 17 plays of 20-plus yards, including five touchdowns. In 2014, he couldn’t sustain that outlying frequency of big plays and notched only nine 20-plus yard gains and one 20-plus yard touchdown, leading to a season in which he only managed five total touchdowns all year – one every 68.8 touches. Goal-line carries, which will be discussed in the next section, surely would have helped his cause – he only received 52 percent of the Eagles’ running back carries inside the five-yard line. Goal-line carries are crucial to a running back’s touchdown potential. 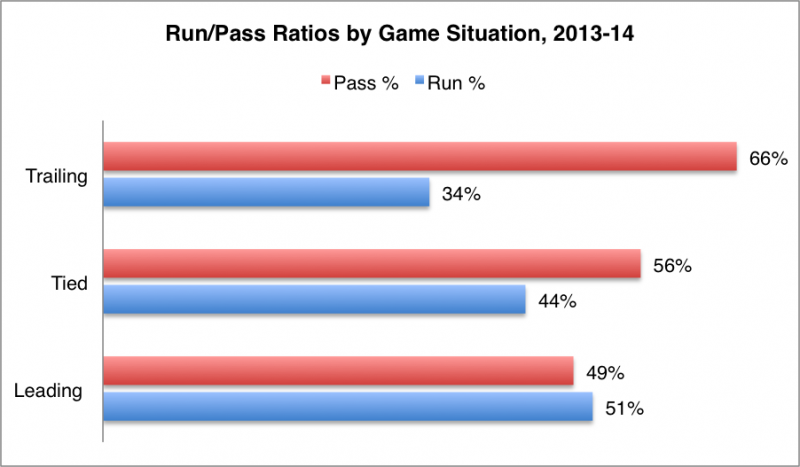 Sixty-one percent of all rushing touchdowns occur inside the five-yard line and 88 percent occur inside the red zone. More than 99 percent of all rushing attempts outside the red zone don’t go for touchdowns – it’s imperative to target running backs that get most or all of their team’s red zone and goal-line work. To visualize how much goal-line carries are worth, I charted the percentage of times a rushing attempt from each yard line inside the opponent’s 10-yard line went for a touchdown over the last ten seasons, as shown in Figure 3 below. Taking a handoff inside the 5-yard-line drastically increases expected fantasy points compared to handoffs at other parts of the field. The average running back carry nets 0.55 FanDuel points, but that figure climbs to 2.45 inside the 5-yard-line. 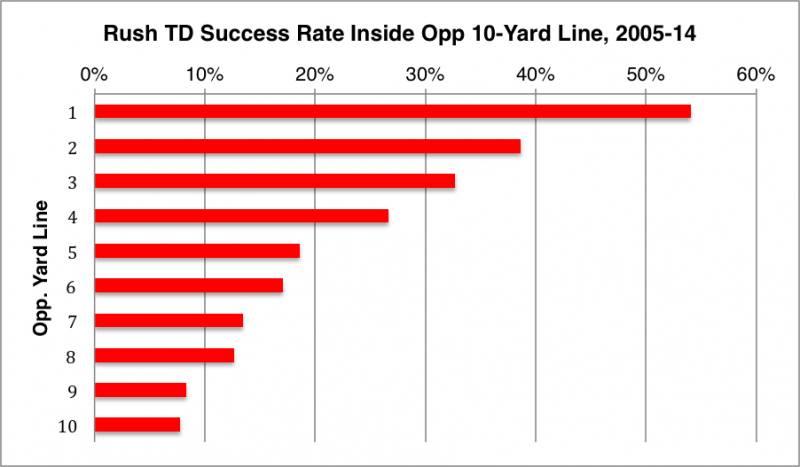 Goal-line opportunities typically arise only one or two times per game – teams average 1.2 rushing attempts inside the 5-yard-line, but are held without a single attempt in that area of the field in 24 percent of games. Therefore, it is imperative the running back you select is his team’s primary goal-line back in order to not miss out on goal-line opportunities when they do arise. Game script goes a long way toward determining how much volume a running back sees in a game. Teams only ran the ball roughly one-third of the time when trailing over the last two seasons, as you can see in Figure 4 below. Positive game script causes not only an increase in volume, but touchdown potential as well. Teams run the ball inside the five-yard line 56 percent of the time when leading or tied, but only 48 percent of the time when trailing. Furthermore, 58 percent of rushing touchdowns occur when a team is leading or tied. The best way to project game script is to refer to the Vegas point spread. Vegas predicts a winner for every game (except pick-‘ems), and winning teams over the last two seasons average 31.1 attempts, 128.7 yards and 1.0 touchdowns, while losing teams average only 22.6 attempts, 94.5 yards and 0.5 touchdowns. That’s a huge difference favoring the winners: 8.5 attempts, 34.2 yards, and 0.5 touchdowns. Vegas oddsmakers have been sufficiently accurate in picking winners to the point that there is a discernable difference between rushing statistics for favorites and underdogs. Table 2 shows rushing averages for favorites and underdogs over the last two seasons. Favorites have been scoring 38 percent more touchdowns and racking up 12 percent more yardage than underdogs. A running back playing on an underdog should rarely, if ever, be an option in a cash game. Your running back not scoring a touchdown is a risk you need to minimize. Teams have been scoring at least one rushing touchdown in a game 59 percent of the time when they're favorites, but only 47 percent of the time when they're underdogs. Passing down snaps allow running backs to withstand negative game script – they can make up for lost rushing volume in the passing game. Limited pass-catching backs such as Alfred Morris and Chris Ivory should nearly always be relegated to tournament plays because their volume hinges on game script, creating volatility. In cash games, you want to minimize variance by targeting backs that can still produce even if the game script doesn’t turn out as expected. Consistent fantasy performers are ideal for cash games due to the balanced payout structure, while volatile performers are more useful in tournaments because of the top-heavy payout structure. Each position has a different inherent level of weekly consistency, which can affect what direction you take in terms of who to pay up for when building your lineup. Running backs, on average, are the second-most consistent fantasy position behind quarterbacks. This is because they get the second-most opportunities to score fantasy points. The league leader in running back touches per game averaged 28.1, which trailed the leader in pass attempts (41.1), but eclipsed the leaders in wide receiver targets (11.5) and tight end targets (8.7). To measure the consistency – or volatility – of a data set, divide its standard of deviation into its mean, giving you its coefficient of variation (CV). I calculated the league-average CV for each fantasy position by taking the average CV of all qualified4 players at each position in 2013 and 2014, shown in Figure 5 below. The shorter the bar, the more consistent the position is. Despite being projected for the same amount of points, the two pairs have a significantly different floor and ceiling due to differences in positional consistency. Pair one would be the better choice in a cash game, while pair two would be the superior selection in a tournament. A player’s Individual CV can also be used to compare the consistency of players within the same position, or at positions with equal CVs, such as running backs and wide receivers on full-point-per-reception formats. For example, Le’Veon Bell averaged 20.6 FanDuel points last year to DeMarco Murray’s 20.1. But Murray’s CV (27 percent) was much lower than Bell’s (48 percent). Murray hit 2x value on FanDuel in 12 of 16 games, while Bell did so in only seven of 16. The caveat with using individual CV is that the sample size will be small, so it would be unwise to become overly reliant on this data. I’ve mentioned this before, but CV is not meant to take the place of projected point-per-dollar values. Rather, it should be combined with projections to clarify the possible range of outcomes – or, floor and ceiling – associated with each player. Once floor and ceiling has been calculated, they can be divided by the player’s salary to arrive at projected floor and ceiling values. Throughout the NFL season, I will apply CV to 4for4’s award-winning projections to arrive at ceiling and floor values. Due to the importance of volume, a matchup is best assessed in terms of what effect it will have on game script, rather than merely in terms of its strength of run defense. For example, last season the Jaguars’ run defense was solid, allowing only 4.06 yards per carry to running backs (the league average was 4.13), yet it surrendered the third-most fantasy points to running backs. Their above average on-paper run defense didn’t matter, because the Jaguars gave up the second-most running back carries in the league. The opposition’s defensive strengths and weaknesses can affect how much volume a running back sees in different facets of the game. Facing a strong pass rush, a running back may have to pass block more, limiting the number of routes he runs. Against a team with a strong secondary, a quarterback may be forced to dump off more to his running back because all other receivers are covered. Limited statistics exist on offensive lineman, but their impact should not be overlooked in the running game. If an injury occurs along the offensive line, it can hamper a team’s rushing attack. For example, last season Browns running backs totaled 562 yards on 117 carries – 4.80 yards per carry – in their first five games. Then in Week 6, center Alex Mack – known as a stout run blocker — got hurt. From Week 7 on, Cleveland running backs’ yards per carry fell to 3.27: only 898 yards on 275 carries. Home teams generally find themselves in better game scripts, which results in better production for running backs at home, as can be seen in Table 3 below. Over the last two seasons, rushing touchdowns occur 21 percent more when a team is at home than when it is on the road. On 58 percent of the 187 cases over the past two seasons when a running back scored 20-plus FanDuel points, he was playing at home. Running backs miss more games due to injury than any other fantasy position, which creates a situation where the best value play in a given week is often a cheap running back filling in for an injured starter. A running back’s fantasy production depends largely on the circumstances surrounding him – his role, the game script, and his team’s offensive line – rather than on his talent alone. If inserted into a good fantasy situation, a low-priced backup has to be merely competent to return value. An injury can have a significant effect on a running back’s value because an injury brings a runner’s volume into question. There’s always the chance of re-injury, plus a coaching staff may be more careful with an injured player, limiting his workload or pulling him out of the game when it is is no longer in doubt. An injury can affect different backs in distinct ways. For example, an ankle injury will tend hamper a runner who relies on quick cuts and agility to break tackles – think C.J. Spiller – more than it will effect a running back who runs north-to-south and relies on power to break tackles – think Eddie Lacy. Positive game script increases a running back’s chances of success – target Vegas favorites. Running backs who get passing down work will be less affected by negative game script. A running back’s upside should be viewed as touchdown potential rather than as big-play potential. Goal-line work is crucial to a running back’s fantasy success – 61 percent of rushing touchdowns occur inside the 5-yard line. Running backs are less consistent than quarterbacks, but more consistent than wide receivers and tight ends. A cheap backup running back filling in for a starter is usually the most valuable type of player in daily fantasy football. 2. To qualify, a running back’s season needed at least six games played and eight-plus fantasy points per game.